People on the receiving end of government programs often see good ways to improve bureaucratic effectiveness. 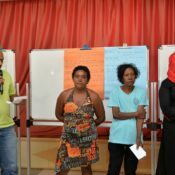 In Mauritius, recipients of low-income housing programs shared their ideas for practical improvements. Managers of national housing programs were impressed. 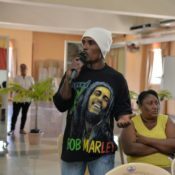 ATD Fourth World in Mauitius recently organized a people’s university to follow up on an earlier meeting about housing issues. The participants, ATD activists, from various neighbourhoods, spoke with two housing officials about finding solutions to the difficulties low-income families face around housing. Participants met with Mr. Gilles L’Entêté, CEO of the National Housing Development Company (NHDC), and Mr. Clifford Vellien, Communications Director of the National Empowerment Foundation (NEF), two organizations responsible for implementing national housing programs. To prepare for the meeting, 40 participants were briefed on the government’s housing policy. They thought through these policies in light of their own experiences, their hopes and the difficulties they have faced. Participants began the meeting by stating that housing is critical for a family to feel safe, but also to be able to plan for the future: “a solid house with running water and electricity”, “a house helps unite a family”, “when a storm comes we do not need to worry or go to a refuge shelter”, “a yard where we can plant and grow things”, “housing represents everything for a person”. The other participants agreed, emphasizing that housing programs answer families’ needs for decent housing that is reliable and accessible to all. 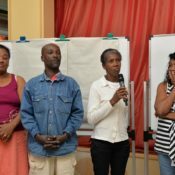 The housing officials explained the differences between the two organizations that provide housing to families according to their income. The NHDC requires a minimum salary of Rs6,200/month (about $178), while the NEF serves families that have salaries less than that amount. Another participant pointed out how difficult it is to pay the high interest rates for their home mortgages when working at low paying jobs. 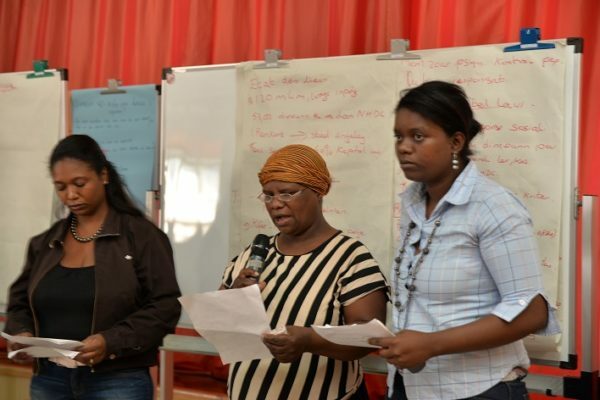 “We propose a system of numbered cards….” Participants from Anoska. 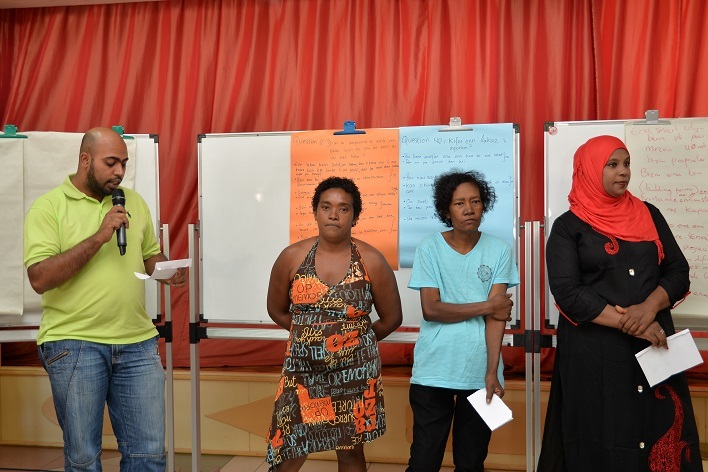 Throughout the session, participants representing several neighbourhoods made proposals and engaged in lengthy debates with the housing officials about their various situations in order to identify solutions to the very real problems they have encountered. Housing organizations are not familiar with the areas where we live. Crowded living conditions force families in one neighborhood to live very close together or paperwork errors sometimes penalize families. 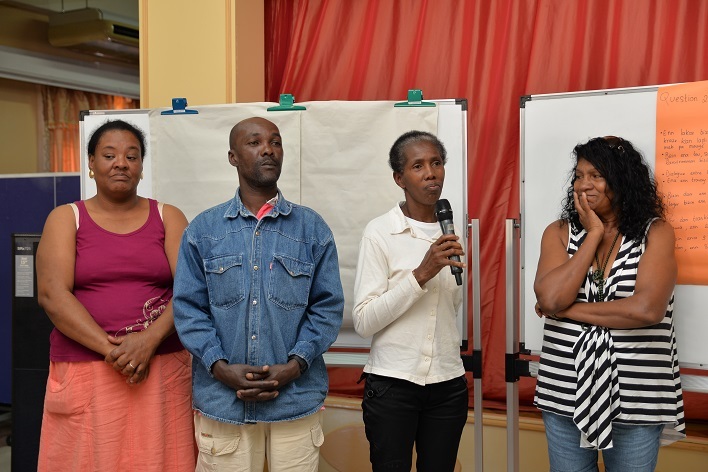 The interest of the housing officials in the participants’ proposals was tangible: “You know, we can also learn from you. Your idea for a card and checklist for following the progress of a case file is very interesting,” emphasized Gilles L’Entêté. 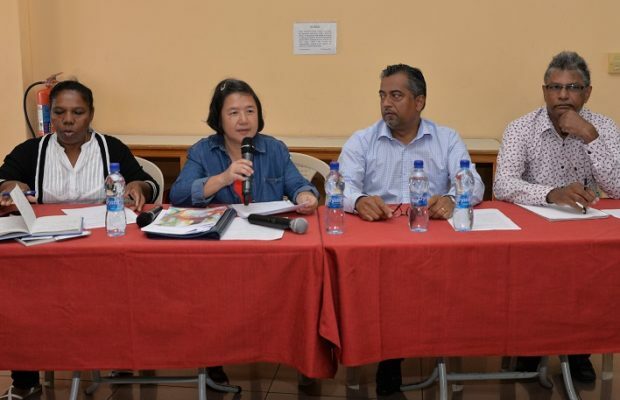 The officials also explained a new system (SRM—Mauritius Social Register) that is intended to launch on-the-ground inquiries into situations of poverty in order to determine if families qualify for certain NEF social services that include family housing, job placement and training, and children’s school supplies. 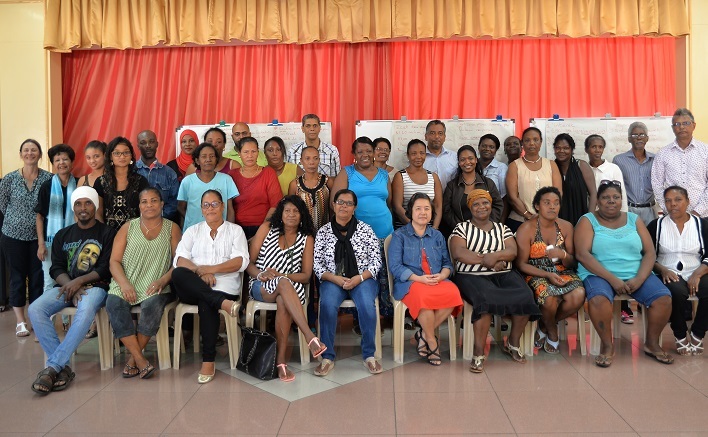 Participants were proud to have taken part in a constructive dialogue in which they could share their thoughts and experiences in ways that led both to concrete proposals and to a commitment from authorities to engage in further discussion.